I'll be really honest - I had some grand plans a few weeks ago that have kind of run out of steam now. Despite my dismay at the end of summer (did we even have a summer?!) I was also pretty excited by all the new season goodies arriving in the shops, and I decided to create a little blog series. My plan was that each post would focus on a different AW17 trend, and for each trend I would pull together some pieces currently available from a few of my favourite high street stores - a "get the look for less" type of deal. But then, you know, life happened. Work got hectic. There was a family reunion, and a blogging event in London (a lovely breakfast at the Ivy Chelsea Garden with a skincare brand - definitely not complaining about that one!) And before I knew it, it was getting into the end of September and I hadn't even looked at my blog, never mind found time to start a new series. How does this even happen? And can we have an extra day in the week please? Or possibly two? When it comes to fashion, red is a colour that seems to divide opinion. Some people love its warmth and vibrancy, others find it too loud and overbearing. I personally have always enjoyed wearing red, but I must admit that dressing head to toe in it feels a bit much, and while it looks great in editorials, I'm not sure it's something I want to replicate in real life! 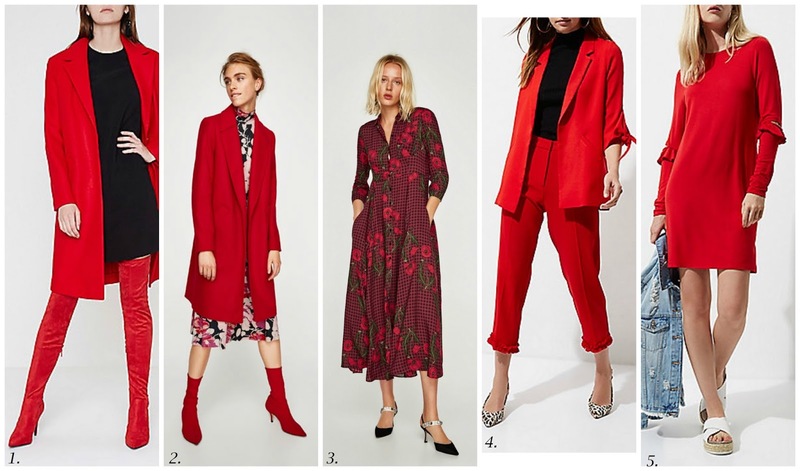 Nevertheless, the AW17 shows were full of these "red to toe" looks, in every shade from pillar box to burgundy, and the high street has certainly picked up on this, offering plenty of their own versions of this trend. Here are a few that have caught my eye. For the seriously fashion forward. And brave. 1. River Island and 2. Zara - Suiting is another huge trend this season, so wearing a full on red suit is definitely one way to score extra fashion points, if you are brave enough! River Island have opted for softer tailoring here, while Zara have gone for a slightly more muted burgundy shade. As much as I think this look is stunning when done well and a real attention grabber, it's just not something I'd ever have cause to wear. If you work in a smart office though, I say why not?! This surely has to be the ultimate in power dressing. 3. H&M - This is a more casual take on the full on red trend, and I love the juxtaposition of textures - the soft mohair of the jumper against the silky skirt. The model is even rocking red lips and nails too because, hello, RED TO TOE. I love everything here, and would wear it all, but would I wear it all together? Hm. I'm undecided. 4. H&M - Now this get up I would absolutely wear. Yes, even the boots, which surprises me because I am really not a fan of the kitten heel. However, paired with this dress, they just seem to work, and there's also something about the amount of leg on show that makes this outfit more wearable than the previous three. It's still all over red, and it still makes an impact, but in a softer way. This is one head to toe red look I could genuinely see myself wearing for events, dinners etc. These looks still kind of qualify as full on red, but don't punch you in the face with it quite as hard, if you know what I mean. 1. River Island - Confession - I think these boots are fabulous. I mean, pillar box red thigh high boots should be so wrong, but I absolutely love the statement these make. I also think they would probably be pretty hard to pull off in real life, but on the other hand, the introduction of the the black jumper dress tones them down and makes the red a lot more wearable. Basically, I am just dreaming about being polished enough to wear these boots without attracting the wrong kind of attention. 2. Zara - Isn't it amazing what a bit of print can do? For me, this is totally wearable, and the matching coat and boots pull the look together and elevate what could otherwise be a fairly ordinary printed dress. 3. Zara - Print works its magic again. For anyone who finds block colour red unflattering against their skin tone, something like this could be a great way to work the trend, as it's so much softer and more forgiving. 4. River Island - Now here is a way to work the red suit that I could actually see working for me. There's a little bit of skin on show, and that paired with the black top and animal print shoes really helps to break up the vast expanse of red. I like the relaxed cut of the jacket and on trend frill details on the trousers too. 5. River Island - Realistically it's probably already too cold to wear this in the UK. However, I love how effortless it is. White, denim and red is definitely a winning combination. Still too much red? It can also work beautifully as a single, statement piece. 1. H&M - I love the fluted sleeves and subtle frills on this pretty blouse. Perfect for pepping up a pair of jeans. 2. River Island - Automatically, I would think of putting jeans with this t-shirt and blazer combo, but the red trousers instantly add a more on trend twist to the outfit. A nice casual way to work the red look. 3. Topshop and 4. 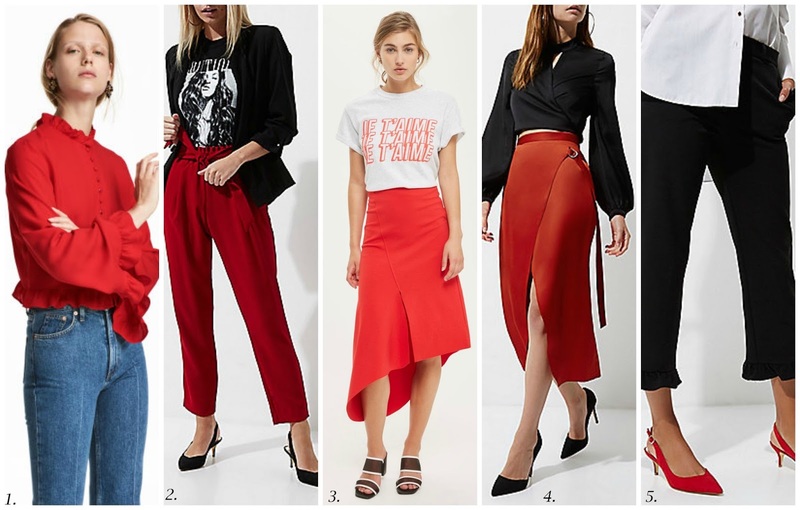 River Island - Here's two ways to rock a red skirt. The Topshop look is more laid-back and features an oh so trendy asymmetrical hem. The River Island version - my favourite - is all slinky and evening appropriate. Lovely for date night! 5. River Island - It seems there is no getting away from kitten heels this season, and I must admit, I love the way this red pair gives the monochrome outfit a bit of wow factor. If I still had an office job, I would definitely be wearing something like this for autumn and winter. When in doubt, add a red accessory to a neutral outfit as a nod to the trend. 1. Topshop and 5. Topshop - Red shoes and boots are everywhere at the moment. If you only want one pop of red in an outfit, footwear is definitely the most on trend way to do it. I personally love the idea of some red ankle boots to put a spin on my usual jeans, jumper and jacket combo. 2. Zara and 4. Topshop - A red handbag always makes a neutral outfit pop. This Zara version is more pink than red so I suppose I'm cheating a little bit with this one, but I love how cute it is, not to mention the Chloe vibes it has going on. The Topshop bag is gorgeous too and probably more useful! 3. Zara - Statement earrings are another big trend right now. I love the ones with all the fringing. These from Zara are absolutely stunning, especially paired with the clashing eye makeup. In theory, I love the idea of these for an evening out worn with a simple black dress. In reality, though, they are probably bigger than my head, but perhaps I will look for a toned down version! What are your thoughts on AW17's red to toe trend? Will you be rocking a full on red suit this season, adding a splash here and there, or avoiding it altogether? I would love to know! 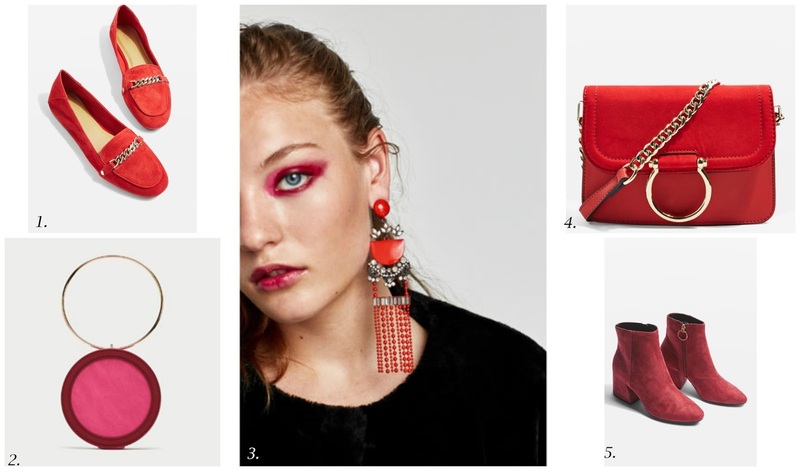 Red is such a gorgeous colour for the new season, and perfectly timed! Zara will definitely be my go-to for autumn! I love red and don´t mind wearing it with a little breakup. Just today I am wearing a red dress to the office, but paired with black shoes. Love your picks, Kate! Full on red scares me a little so I plan on adding one piece to a look - that high low skirt is gorgeous! I'm a huge fan of red, always have been and always will be. I don't think I can pull off the red head to toes look though, I like it to be a pop of colour than in your face. I'm glad I'm not the only sad that Summer (what Summer) is over... Maybe if we had one we wouldn't be glum it's autumn already! I love red & have been meaning to incorporate it into my wardrobe so I have been investing. I prefer the one statement piece rather than red-to-toe. Love the Topshop red bag, very Chloe! Love this great post, truly inspiring, thank you for sharing!!! Absolutely adore red at the moment! Oh yes! I'm loving all the red style selections! I love those red topshop boots since they aren't too bright! I don't think bright red is a colour that suits me so I'll have to try a more subtle red! I did get the chance to go shopping and see what's in store, but I'm quite happy that red is the colour of fall! I don't wear much colours, but red is definitely my favourite! Red is one of my favorite colors, I like 'all red' outfits, but personaly I prefer to combined it with grey or black. Definitely the hottest color of the season! I love your picks, especially that bag in the last pic! Red is so nice for fall and the holidays! Glad it is actually in style too! 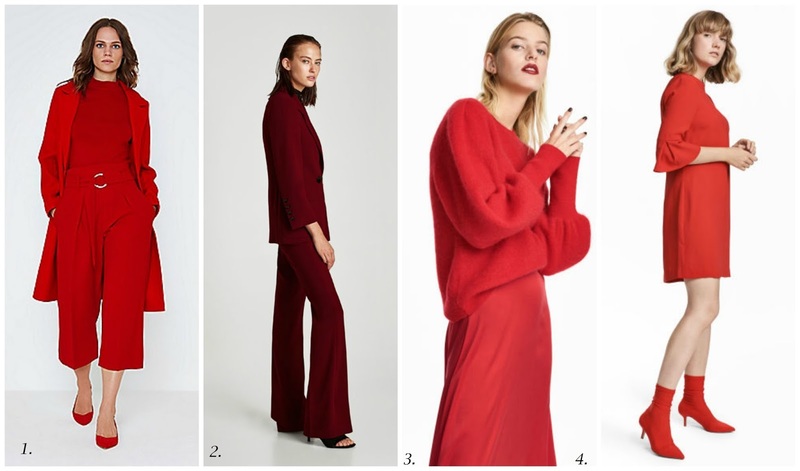 Love the all red trend! Such a great write up!